Fethard Co. Tipperary (pop. 1,504) is the most complete and best preserved small walled town in Ireland. Although located near major tourism magnets Cashel and Kilkenny, it is off the beaten track and its heritage assets attracted few visitors. Recognising that the beautiful 17c Tholsel in the town centre was an unexploited cultural asset and perfectly positioned for footfall, Fethard Business & Tourism Council, with encouragement from the Heritage Council and support from South Tipperary Co. Council and Fáilte Ireland, restored the Tholsel as the site for an exhibition/experience which would promote Fethard as a significant tourism destination. 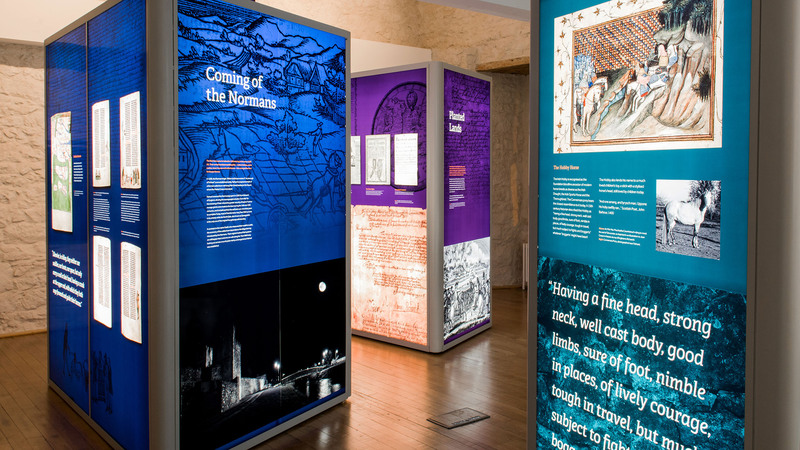 Event’s challenge was to realise the Client’s vision by identifying a unique and appealing proposition for Fethard, developing a robust, distinctive and compelling narrative, and designing and managing the delivery of every aspect of the project. In Event’s opinion, Fethard’s historic built environment, alone, would be unlikely to compete successfully with nearby Kilkenny and the Rock of Cashel. Fethard needed its own USP. Ireland is famous for its horses and Fethard sits at the heart of the most renowned breeding and training establishments in the world – Coolmore, Ballydoyle, Kiltinan etc. Event suggested that Fethard take ownership of Horse Country and that its exceptional walled town history and the region’s celebrated horse industries and activities should be combined in a uniquely compelling presentation. The Tholsel building presented challenges in terms of display and flow, including the fact that its three floors existing “in isolation”, gave no sense of continuity. To entice visitors, build anticipation and set the mood, Event inserted an Introductory Experience at ground level. Local resident Andrew Lloyd Webber composed the music. In collaboration with Architect Michael O’Boyle a mezzanine element was created at second floor level, enabling the entire historic structure to be read. The gable end, thus exposed, offered an opportunity to insert a multi-media installation, linking first and second floors by a dramatic overview of Fethard through time. Interpretative design knits together the story of people and the story of horses. The narrative is broadly divided into two chapters – the story of the town, told on the first floor and the story of the horse in the locality, on the second. 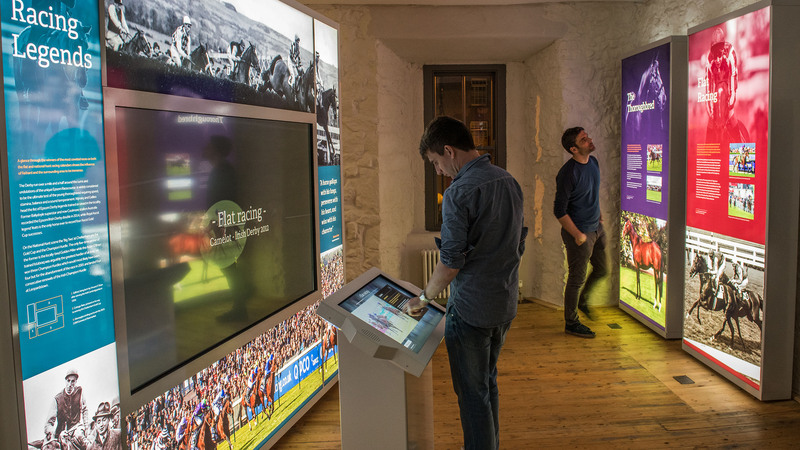 Free-standing displays leave the historic fabric untouched, shape the visitor route and provide elegant housing for graphic, object and media exhibits. Glass and metal create an overall feeling of lightness, enabling the historic interiors to sing. 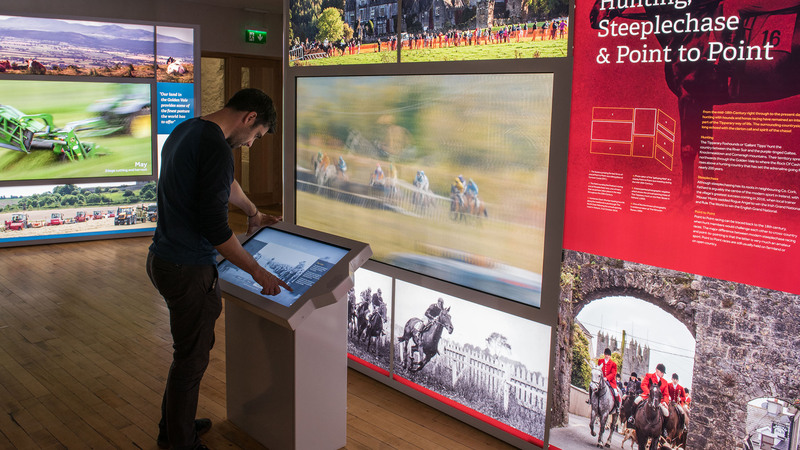 Dynamic Video Walls and Interactive Tables explore local archaeology, myths and legends, the town’s history and the diversity, skills and heritage of the local horse breeding community. An unrivalled collection of photographic assets is celebrated and their stories made coherent and engaging. Typeface – Adelle –it is warm and approachable character and slab elements reflecting local medieval architecture, was chosen for headline text and Dalton Maags Effra for bodycopy. The striking and colourful Fethard Horse Country Experience identity was designed to stand out and be flexible for both digital and print environments.